Printed directly onto styrene, this durable plastic chart is approximately 1/16" thick and has metal eyelets in top corners for convenient wall hanging; markable (wipe on/wipe off). Styrene charts are UV coated, latex free and feature bold and bright colors. The chart will remain upright on an easel for presentations and will stand up to heavy use in the office or classroom. 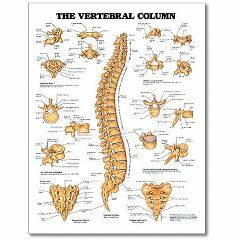 Charts can be displayed with chart stands, anatomical charts measure 20" W x 26" H.